STOP’s ongoing review of the Navy’s recently released Northwest Training and Testing Final Environmental Impact Statement (FEIS) has identified what we believe are a number of significant violations of the National Environmental Policy Act (NEPA). 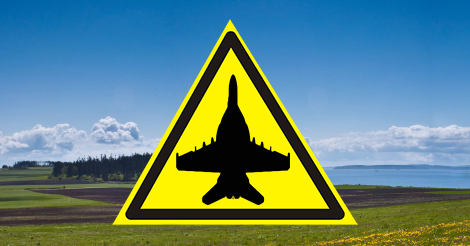 In our last update, we discussed how other government agencies have criticized the Navy’s analysis of the noise impacts of the aircraft using the proposed Pacific Northwest Electronic Warfare Range. In this update we discuss another gross deficiency – the complete failure to analyze the impacts of the electromagnetic radiation that would be emitted by the electronic warfare weapons with which the aircraft using the proposed EWR will be equipped. Section 2.3 of the FEIS has an extensive listing and description of sonar systems, ordnance, munitions, targets, and other systems to “facilitate understanding of both the activities and the analysis of the environmental effects of their use.” The potential environmental impacts of those systems are then analyzed in Section 3 of the FEIS. However, no such listing or description is included in the FEIS for the electronic attack weapons with which the EA-18G Growlers are fitted. This is especially ironic because the whole purpose of the EWR is to provide testing and training in the operation of those systems. A recent article in the online publication Defense Systems noted the Navy” is upgrading its electronic attack aircraft, the EA-18G Growler” and described the Growler as “an advanced airborne electronic attack platform, with electronic warfare capabilities” including “non-traditional electronic attack” weapons. According to its Environmental Assessment, the EWR is intended to “sustain and enhance the level and type of EW training currently being conducted by assets using the [Northwest Training Range Complex], to provide the ability to accommodate growth in future training requirements, and to maximize the ability of local units to achieve their training requirements on local ranges.” It is also intended to provide “combat-ready Tactical Electronic Attack squadrons which are fully trained.” This degree of training would require the use of “non-traditional electronic attack” weapons within the EWR. Before any rational analysis of the effects of the EWR can be made, it is essential that the specifications of all the electronic attack weapons to be used in the EWR, including “non-traditional electronic attack” weapons, be known. This is especially so with non-traditional electronic attack weapons being a part of the Growler’s arsenal, and with those weapons apparently being designed to harm people. We invite all of you to share your knowledge and concerns regarding electronic attack weapons with us and the public so that this aspect of the EWR might receive the proper attention. We invite the Navy to recognize the deficiencies in its NEPA documents, and to start anew by drafting a scoping document to begin the proper analysis of the environmental impacts of the EWR. So let me get this straight – the Navy won’t speak to you, so you’re going to ask them to tell you the “technical specifications” of their electronic attack weaponry, the most classified field of warfare in the entire DOD? You’ll get nothing. No technical specs, because that information isn’t publicly releasable. You better find a pilot to give you classified information because otherwise, you’re asking the DOD to tell you classified information. Surely, your attorney told you the NEPA doesn’t grant you access to classified information and programs, right? Only Growler pilots and the folks who work on those weapons know how the systems work. You better call Edward Snowden or Bradley Manning. You can share the prison cell right next to them! Oh, and by the way, this paper was written in 1998. Much cooler stuff out there now. Enjoy the noise in January. Just for you, I hope they use extra afterburner – and there’s nothing you can do about it. And the Military Operations Areas on the Olympic Peninsula – have you heard the good news yet?? I have, and I can’t wait until you hear. You better enjoy the holidays, because you’re not gonna be happy! You guys have got to be kidding – I read this entire paper. It’s about MICROWAVE technologies. That has nothing at all to do with the Growler. The jammers on the Growler operate in the Radio Wave part of the EM spectrum, the exact frequency range of every radar dish. That is not the same as the microwave part of the EM spectrum. The Growlers don’t jam things by heating them like a microwave. That’s simply not how jamming works. You’ve got the wrong topic completely and clearly no knowledge of physics. Jammers are quite simple really if you understand basic radar theory – which you don’t. Let me guess – someone told you this is how it works, right? Nice try, but they’re wrong.